You’ve seen it in TV shows, and perhaps even from the plane as you’ve flown into Seattle Tacoma International Airport. It’s enormous, eye-catching, and it even lights up! Here are a few fun facts that you might not already know about one of Seattle’s most recognizable landmarks: The Seattle Space Needle. The designer of the nation’s first shopping mall, John Graham, created the final, saucer-shaped design of the Seattle Space Needle. It was built in a record-breaking 400 days, earning it the nickname “The 400 Day Wonder.” Upon its completion, it was featured at the 1962 World’s Fair. Built mostly of concrete and steel, it’s meant to stand up to wind velocities reaching 200 miles per hour, and earthquakes with up to a 9.1 magnitude. Despite its super-strength, it sways approximately 1inch for every 10mph of wind. The dome at the top of the Seattle Space Needle houses one of the world’s first revolving restaurants, SkyCity. Technically, the entire saucer does not rotate– it’s just the 14-foot ring next to the windows on the restaurant-level that actually spins. The observation deck sits at 520ft. in the air, and allows for panoramic views that include the downtown Seattle skyline, Olympic and Cascade Mountains, Mount Rainier, Mount Baker, and Elliott Bay and its surrounding islands. In 1999, the city of Seattle named the Space Needle a historic landmark. It is one of the city’s most famous, and recognized symbols. You’ve likely seen it on TV, and in the movies– from Frasier and Sleepless in Seattle, to Bill Nye The Science Guy and Austin Powers: The Spy Who Shagged Me—Hollywood is enamored with this grand saucer in the sky. 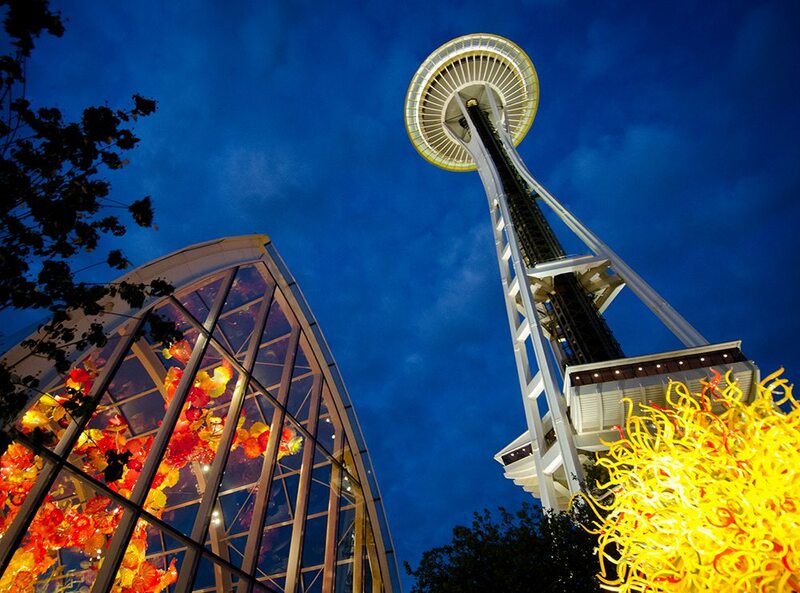 Check out the Seattle Space Needle up close, only a few minutes from Pan Pacific Seattle!